The Cygnus spacecraft, which launched from Wallops Island Flight Facility in Virginia on September 18th, successfully docked with the International Space Station this morning after astronauts aboard the ISS nabbed it with the station’s robotic arm. Built by private aerospace group Orbital Sciences Corp., Cygnus was carrying 1,300 pounds of supplies. The spacecraft was supposed to meet the ISS last Sunday, but NASA and Orbital delayed that docking attempt because of a problem with data formatting. There was also crew turnover on the ISS on Wednesday which pushed Cygnus back on the schedule. But once the docking attempt was underway everything apparently went smoothly. Today, with the successful berthing of the Orbital Sciences Cygnus cargo module to the ISS, we have expanded America’s capability for reliably transporting cargo to low-Earth orbit . . . As commercial partners demonstrate their new systems for reaching the Station, we at NASA continue to focus on the technologies to reach an asteroid and Mars. Space X was the first private company to deliver cargo to the ISS in May 2012, and now that Orbital has also done it, we may start to really see how the competitive market is going to evolve for aerospace companies. NASA partnerships are clearly still a factor, Orbital and NASA have a $1.9 billion agreement for eight cargo deliveries from Cygnus spacecrafts, and it’s worth noting that Orbital received $288 million in early funding from NASA to develop the Cygnus project. 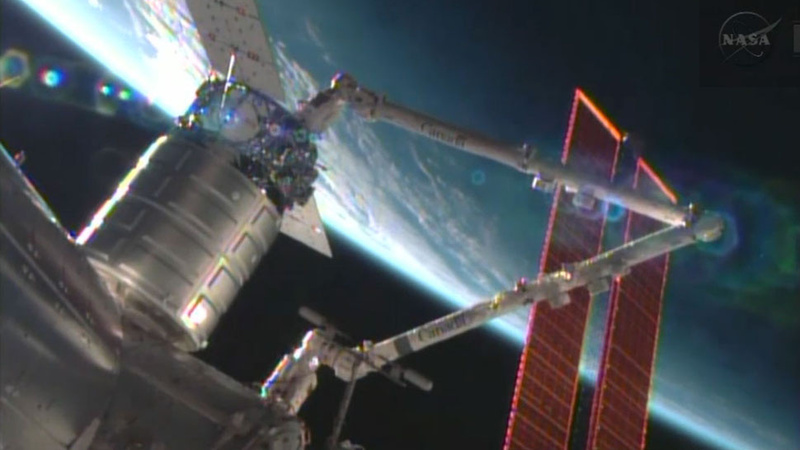 Cygnus, a 17-foot-long silver cylinder that can carry up to 4,409 pounds of supplies, will stay docked until October 22, at which point it will fall toward Earth. It is designed to burn up in the atmosphere.